By Christie Whitney on June 13, 2017 in Featured, Retirement Investing. In her recent Wall Street Journal column, Chana R. Schoenberger details the many pitfalls that families with college-bound children face, and the simple steps you can take to prevent and/or remedy these mistakes. Read the article, in full, below. As the school year ends, summer vacation offers parents and students alike the opportunity to focus on what may be their most dreaded subject: paying for college. Unfortunately, many of them will deserve an A for effort, but a middling C for execution. That’s because many families continue to commit unforced errors in their efforts to save and pay for the hefty tuition bills that typically await. It’s no disgrace, since few people have all the nuances covered. But experts say that some of the biggest blunders being made can be easily fixed. Among the traps people fall into: obsessing about Ivy League schools; thinking it isn’t worth it to even apply for aid or scholarships; and not considering “529” college-savings plans—investment accounts that offer big tax advantages when the profits are used to pay for higher education. Only about one-third of parents are even aware of 529s, according to the latest annual survey, released in May, by St. Louis brokerage firm Edward Jones. Here are some of the main mistakes that families make, and how to fix them. Just 1 in 8 students at private, nonprofit colleges pay full freight for school. Yet many upper-income and even middle-class families don’t apply for aid or fill out the Free Application for Federal Student Aid, or Fafsa. Many figure that they won’t be approved, or that it will prejudice the admissions decision makers against their student. “They just assume they’re not going to qualify for any need-based financial aid,” says Anne Sturtevant, executive director of higher education at the College Board. But many factors can improve the chances that a family will get aid, including the cost of the school, how many children in the family are in college and any special circumstances. “There’s a tendency among middle-income families for the parents to overestimate eligibility for merit aid and underestimate eligibility for need-based aid,” says Mark Kantrowitz, publisher and vice president of strategy at the scholarship site Cappex.com. Merit aid is typically for overqualified students whom the college wants to attract, while need-based aid is about the family’s financial situation, not the student’s own résumé. It’s also a mistake not to apply for financial aid before freshman year. Some families delay applications for aid to subsequent years, to minimize the possibility that a request for aid could hurt their student’s chance of being admitted. But colleges don’t like it when families try to game the system, so they typically restrict new applications for aid to students whose financial circumstances have changed, Mr. Kantrowitz says. Some parents may not want to apply for financial aid, fearing it could affect their child’s admission chances. In some cases that’s true, and parents should first check to see if the school considers applicants’ financial situations in its admission process. Parents should be aware, though, that for at least some of these schools, it will affect only how much aid they receive—not whether their child gets in or not. The stats are glum. 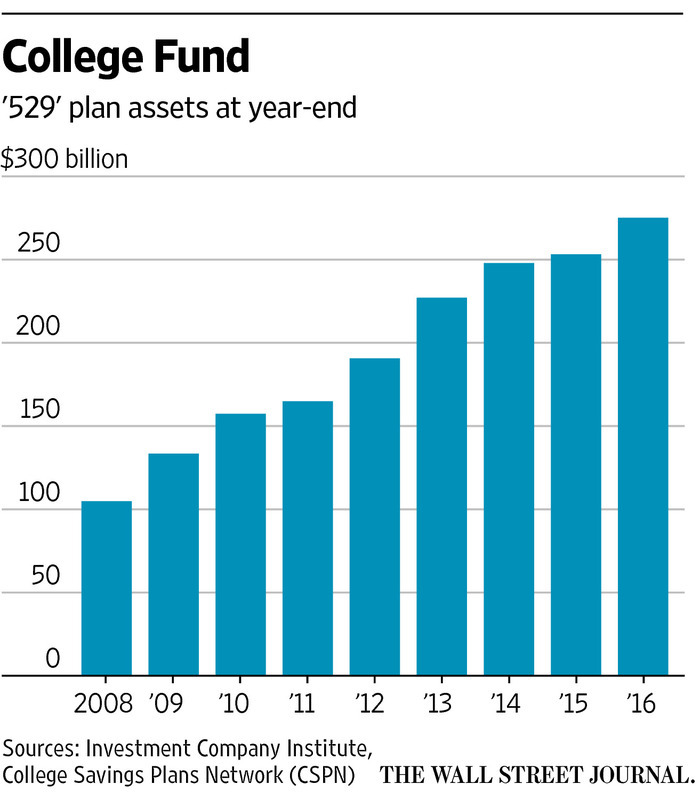 Yes, more than $275 billion was stuffed into these tax-advantaged higher-education investment accounts at the end of 2016, according to the Investment Company Institute. But according to the Edward Jones survey, just 32% of Americans are aware of 529s, and, when asked how they have paid or how they plan to pay for college, only 14% cited a 529. That is misguided, says Mr. Kantrowitz, who argues that 529s are the best tool available to save for college. A 529 account allows you to invest after-tax money for the benefit of your child (or another designated recipient). The money is invested in mutual funds, and no federal tax is owed on withdrawals as long as they are used to pay for qualified higher-education expenses. If your child wins a scholarship or goes to a military service academy, you can withdraw the equivalent amount from the account without penalty (you’ll have to pay income taxes on the portion that represents your gains, but not on your contributions). If plans change, you can retitle the account, pointing it to any direct relative of the original beneficiary—another sibling, or cousin, for instance. The plans come with state-tax benefits in some states as well. There’s little downside: If you take the money out for a nonqualified reason, you just have to pay income tax on the gains and a 10% penalty. But parents shouldn’t count on their financial adviser to set them up with a plan, says Kent McDill, a researcher at Spectrem Group, which analyzes the behavior of wealthy investors. A Spectrem survey found that only 16% of investors with more than $100,000 in nonresidential assets held a 529 account. “Advisers don’t promote the plan because there’s no benefit to them,” Mr. McDill says. That is because advisers don’t get paid extra to push their clients into 529s, unless they happen to work for a firm that offers a 529 program, he says. Even small contributions to a 529 will still help. Parents should aim to save at least one-third of their student’s expected college costs. Because these expenses typically go up by a factor of three over 17 years, their savings goal should be the cost of a college education in the year the baby was born, Mr. Kantrowitz says. If parents can’t afford to pay for college all at once—and few can—their best strategy is to pay for some with college savings (in a 529, ideally), some with current income, and borrow the rest. And take advantage of tuition installment plans, which allow payments over the course of the school year for a nominal fee. Families have plans for how they’re going to pay for college. But they rarely have backup plans, says Sara Goldrick-Rab, a professor of policy, organizational and leadership studies at Temple University in Philadelphia who studies higher-education funding. For instance, what happens if a parent doesn’t qualify for a Parent Plus loan, which requires a credit check? Or if parents establish a financial plan that assumes their student will work 20 hours a week, but the student can’t find a job for as many hours? What if the student plans to take 15 credits and graduate early, but the work is too hard, so she ends up dropping a class and doing poorly in another, landing her in academic probation and imperiling her financial aid? What if her roommate doesn’t work out and she needs to move into another housing situation in the middle of the semester? How about if the parents make more money this year than last, and their student loses some of her aid as a result? It’s important to have a family conversation about how much parents can afford to pay for college, before deciding where the student will enroll, Prof. Goldrick-Rab says. Another common mistake is not factoring in accurate costs for housing and food, which can exceed a student’s budget by thousands of dollars a year, she says. As a result, parents should research the actual cost of living in the college’s local area, and not just rely on the figures the college gives out. Scholarships are the best way to attend school courtesy of someone else’s money, although earning outside scholarships will likely reduce any aid you received from the college by the same amount. Many students don’t approach the scholarship process in the best way, Ms. Sturtevant says. Students have a higher likelihood of qualifying for scholarships in their local area, so they should start in the college counselor’s office by looking through records of scholarships earlier graduates have won, she says. Ideally, their goal should be to obtain more in scholarship money than the school offers them in either grants or loans. “Look at sources you’re likely to qualify for, renewable over four years or a big dollar amount, so when you’re spending all that effort you’ll get the biggest bang for your buck,” she says. Just 0.2% of students receive $25,000 or more in scholarships for one year, so a free ride is exceedingly rare, Mr. Kantrowitz says. The best bet is to cobble together many small scholarships. Students should try one of the free scholarship-matching services online; they should never pay a fee for this information. They should enter as much biographical detail as possible. This will allow them to apply for scholarships aimed at niches like students whose siblings have had cancer or whose ancestors came from a specific country. Most people skip over scholarships that award less than $1,000 as well as essay contests, so these are untapped resources. Think the Ivy League is the only college pedigree that matters? Just 2.7% of undergraduate applications in 2015 went to the eight universities that belong to this club, Mr. Kantrowitz says—and that is applications, not individuals, many of whom applied to multiple Ivy schools. Most American college students are at public institutions where admissions are moderately selective, not cutthroat. So while an elite education definitely can pay dividends, families should focus on aligning what they can spend with their student’s needs, wishes and academic performance. With 4,000 colleges in the U.S., don’t fall in love with one from the start. “Students will do better if they go to a college they can afford that is a match for them academically—where they will be challenged but not overwhelmed,” Ms. Sturtevant says. With 4,000 colleges in the U.S., it is also a mistake to fall in love with one school too early in the process. You can’t know what school is best for you after visiting a single campus, says Prof. Goldrick-Rab. Students often get hung up on a particular school without knowing their full range of options, she says, and parents struggle to afford it although the student could easily have been happy at a different campus.